On Thursday October 12, a small asteroid estimated to be between 10 and 30 meters in size is going to be the subject of international attention as a global team of scientists observe its orbit past the Earth. 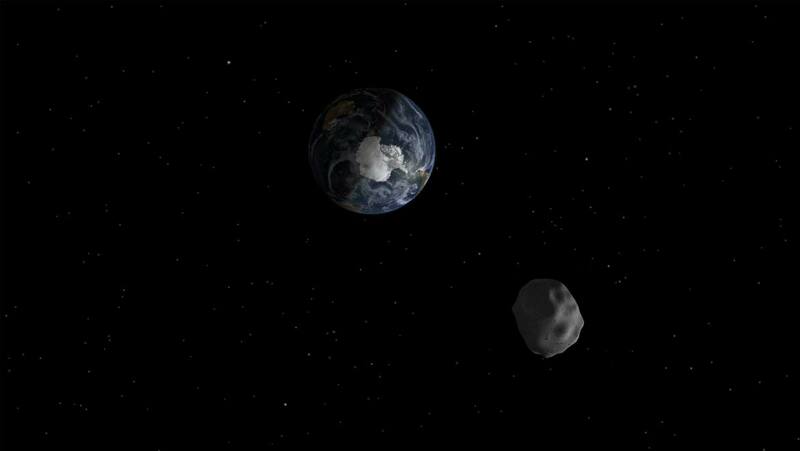 The asteroid, known as 2012 TC4, is due to pass us by at an altitude of around 44,000km (27,300 miles). This is lower than the altitude that the majority of geosynchronous satellites orbit the Earth. Its predicted that TC4 will be closest to the Earth as it passes just south of Australia, at around 05.41 GMT. The main reason that this particular asteroid is of interest is that it gives astronomers the perfect chance to test the global asteroid pre-warning system. This system, known as the International Asteroid Warning Network, is made up of a worldwide network of observatories, universities and research labs. This system identifies asteroids which have been identified as due to pass close to Earth, predicting their possible orbit and size. The close approach of TC4 on Thursday will allow the accuracy of the warning system to be tested. The idea is to help avoid events such as the meteoroid which exploded above Chelyabinsk, Russia in 2013, injuring over 1,200 people. That particular meteoroid had not been picked up by any warning system and as such took us all quite by surprise. In contrast, scientists have been tracking TC4 with Paul Chodas, manager of the Center for Near-Earth Object Studies (CNEOS) explaining that: "This is the perfect target for such an exercise because while we know the orbit of 2012 TC4 well enough to be absolutely certain it will not impact Earth, we haven't established its exact path just yet. It will be incumbent upon the observatories to get a fix on the asteroid as it approaches, and work together to obtain follow-up observations than make more refined asteroid orbit determinations possible." Professor Vishnu Reddy, based at the University of Arizona’s Lunar and Planetary Laboratory agrees that the study of TC4 allows for the collaboration between many different organizations, saying: "This is a team effort that involves more than a dozen observatories, universities and labs across the globe so we can collectively learn the strengths and limitations of our near-Earth object observation capabilities. This effort will exercise the entire system, to include the initial and follow-up observations, precise orbit determination, and international communications." When speaking to The Guardian, Detlef Koschny, from the European Space Agency’s Near-Earth Object programme said that: “For us this is a test case. We are practising for the real serious case.” The majority of scientists do indeed believe that it’s only a matter of time before the Earth is again hit by a massive asteroid, although as yet there are no predictions as to when this might happen. And indeed if it did, currently there is little we could do about it other than evacuate the areas thought to be most at risk.